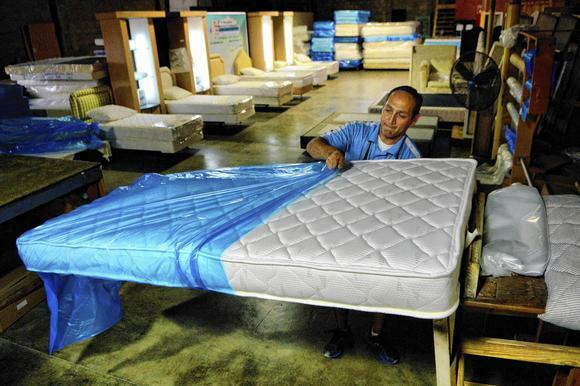 Making other people’s beds has been way of life for one South Florida company for 58 years. Over the decades from its small factory in West Palm Beach, E.J. Schrader Mattress Co. has built a reputation for creating quality custom-made mattresses and beds for clients, who range from the affluent and famous to athletes and regular joes. Diane and her husband Blair run the family-owned business at 6601 Norton Ave., with nine full-time employees. Blair’s father — the late Enoch Schrader — started the private-label bedding company in 1956 after more than 25 years of making mattresses for other manufacturers. Today, E.J. Schrader custom bedding can be found in luxury estate homes, bungalows and on yachts, sailboats and motor coaches. Some of its beds have even taken flight aboard private planes of kings and Russian billionaires, Diane Schrader said. The company did all the mattresses in the former Kennedy estate in Palm Beach, and also supplied them to the Mar-a-Lago Estate before Donald Trump acquired it, she said. It’s also done custom bedding for Bing Crosby, Jimmy Buffett and Gianni Versace’s South Beach mansion. E.J. Schrader’s specialization includes crafting his-and-her mattresses with different levels of firmness and providing chemical-free mattresses for customers with allergies or who are sensitive to certain smells. It also offers upholstery services. “We stay pretty much busy year-round,” Blair Schrader said. The company makes about 8,000 to 12,000 beds and mattresses a year and prices for its custom bedding can ran range from hundreds of dollars to up to $36,000 depending on the level of customization. The company’s attention to detail and quality craftsmanship has earned it a loyal following among interior designers. Although the majority of business — 60 percent — comes through interior designers, more individuals are now making direct contact through the Internet, Diane said. About 75 percent of the business is residential; the rest is marine and transportation related. While the Schraders declined to disclose company revenues, Diane said 2013 was its best year for sales and net profit since 2005, Diane said. And 2014 is already seeing record months over last year. “That’s telling us the economy is coming back,” she said. E. J. Schrader beds and mattresses are made mostly by hand, and can take anywhere from a few hours to several days to complete, depending on the specialization. “We get to do a lot of crazy things,” Diane said. Unusual requests have included outfitting the back seat of a Bentley with a removable mattress; round and pear-shaped mattresses shipped to Las Vegas and round mattresses for adult tree houses. Probably the strangest request it has received over the decades came recently from the television show Inside Edition, which ordered a mattress with a large indentation in it for a Broward County reality TV star who was undergoing plastic surgery to enlarge her buttocks. Schrader built the mattress to accommodate the woman’s oversized breasts as she had to lie on her stomach during recovery. Her bottom could also fit in it if she needed to roll over. Inside Edition featured that customer last month in a segment of its news magazine program, Diane said. The woman identified as Lacey Wildd is seen trying out the custom-made mattress as some of her children look on.